Since Boomers believe that they're getting better with age, marketers need to get better at the way they market to age. The brands and businesses that figure this out first will realize astonishing growth in this uncontested space .....and that is precisely the point of Getting Better With Age - Improving Marketing in the Age of Aging. Getting Better With Age is the second volume in Peter Hubbell's Age of Aging series. His first: The Old Rush - Marketing for Gold in the Age of Aging (2014) was honored with numerous accolades including the Axiom Business Book Award and the Indie Excellence Award. The Old Rush was also a finalist for the International Book Awards and the USA Best Business Book Awards. This new work begins where The Old Rush ended by offering a comprehensive view of aging, ranging from the financial implications of the longevity economy to the consumer behavior influenced by the psychology of aging. He then puts these findings into context by sharing a series of five "metaphorical case studies" that explore the ways that things -- such as Wine, Cheese, Leather, Cast Iron Skillets and Memories - get better with age. Finally, Hubbell offers readers 50 Ways to Get Better With Age - a wealth of aphorisms that offer immediate and actionable advice for brands that have come to appreciate the power of "getting better with age" and are ready to get started. If you're looking for the secrets to success, this book is brimming with secrets gleaned from the author's extensive career in advertising and his rise to prominence as one of the world's leading experts on marketing to age. It's serious business content served up as enjoyably as fine wine that gets better with age. PETER HUBBELL is the Founder and CEO of BoomAgers, the preeminent advertising agency and brand consultancy dedicated to the aging consumer. Since starting BoomAgers and publishing his first book, The Old Rush, Peter has emerged as a leading voice in the global aging conversation. He is a widely sought expert on the topic and is a regular contributor to HuffingtonPost, Mediapost, 33 Voices and other influential marketing content providers.As an accomplished advertising executive with a career spanning 30 plus years, Peter has had an impact at some of the world's best-known agencies. His body of work includes memorable campaigns for blue-chip global marketers including General Mills, Pillsbury and Procter & Gamble, now also a client at BoomAgers. 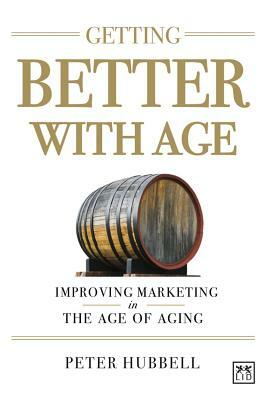 Getting Better With Age is rich on insight into aging and draws from the author's extensive hands on experiences in advertising. Peter takes readers on a journey through the phenomenon of aging - from the science to the mythology to the implications. As a companion to The Old Rush, this new work is spot on for marketers who have come to appreciate the extraordinary value in marketing to age and are looking for inspiration and practical advice to shape the conception of world class marketing programs.